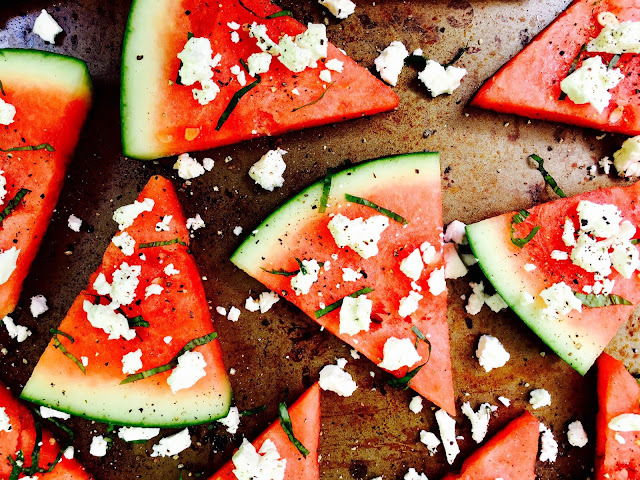 Handheld Watermelon Feta Basil Salads are the perfect appetizer for #CookoutWeek! 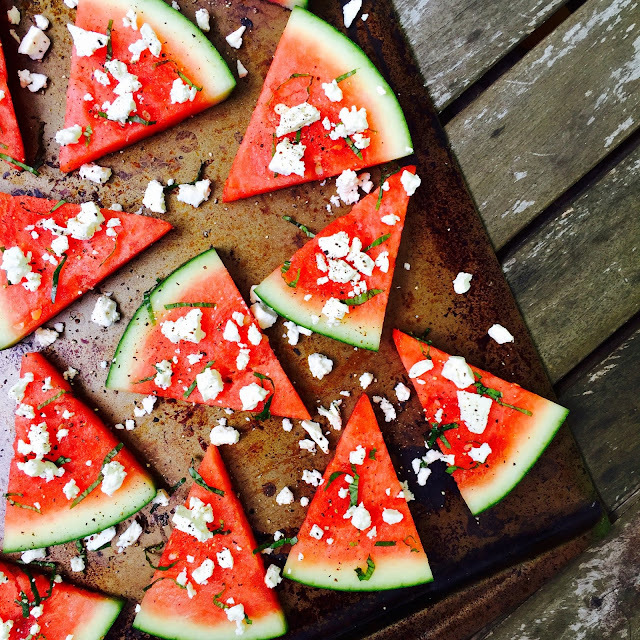 Easy, bright, and delicious bites of watermelon, feta, and basil will be a hit at any summer BBQ. Get those grills fired up... because it's #CookoutWeek 2017! This week, the Full Belly Sisters are joining forces with over 40 food blogger friends to bring you delicious recipes perfect for every backyard BBQ, picnic, summer party, or cookout. We also have a fabulous giveaway featuring products from the brands who have made #CookoutWeek possible. Enter below to win! Now, when you think backyard BBQ, you might be picturing burgers and steaks and hot dogs. But don't forget the lighter fare! Salads are great for vegetarians and carnivores alike. And my Handheld Watermelon Feta Basil Salads are a perfectly pretty—and portable—appetizer. It's a great salad for a cookout because you don't have to worry about lettuce getting soggy. And my version is easy and casual—no fussy melon baller necessary. Just a few minutes and a few ingredients and you've got a fresh, fun dish that is rustic yet elegant. And it's sure to please everyone in your cookout crowd! This isn't the kind of recipe that needs exact measurements. Eyeball it. Use more cheese. Skip the pepper or lime juice. Replace the basil with mint. It's all good, seriously. Play around and find your favorite combo. Cut the 1/4 watermelon wedge across into about 3/4" slices. Then cut each slice in half, so you have a bunch of small triangles (they'll each be about three- or four-bites big). Spread them on a large cutting board or a big ol' cookie sheet (as I did). 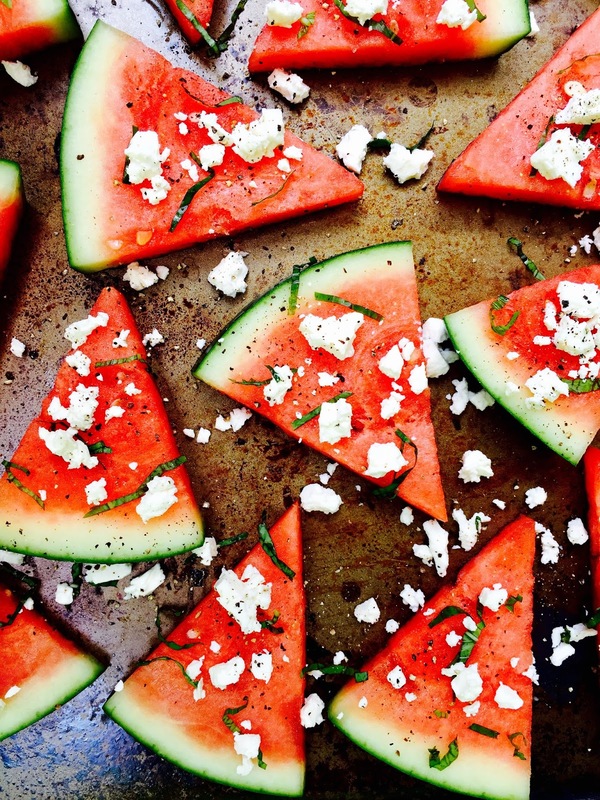 Sprinkle the basil and feta over all the triangles of melon. Then crack black pepper over everything and squeeze fresh lime juice over it all. Everyone can just help themselves and nosh on these juicy, sweet, little salads while you're working the grill. It's such a fun and unique appetizer. Hope you enjoy it as much as we do. As one of the bonus entries in the giveaway, leave a comment on this blog post... what is your favorite vegetarian dish to eat at a cookout? Roasted Vegetables! Smoky and delicious Broccoli, Cauliflower, Red Onion and Potatoes! 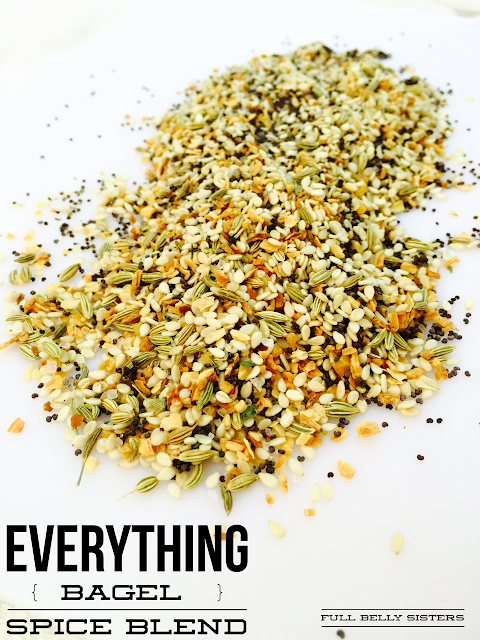 This is a great side dish for a summer get together. Favorite vegetarian dish at a cookout: margaritas! These look so yummy! I could go for one for lunch today!